The journal Palaeontology is devoted to the publication of innovative and timely hypothesis-driven research that significantly advances our understanding of the history of life on Earth. Its scope includes palaeozoology, palaeobotany, systematic studies, palaeoecology, micropalaeontology, palaeobiogeography, functional morphology, stratigraphy, taxonomy, taphonomy, palaeoenvironmental reconstruction, palaeoclimate analysis and biomineralization studies. Synthetic papers that span several of these areas are particularly welcome. Original Article: Reports of original research that advance our understanding of palaeontology in significant ways, either by the application of innovative approaches, or by addressing current issues in palaeontology with new empirical data. Usually 10–25 printed pages in length. Online colour is free, but print colour and open access are optional at authors' expense. Review: Authoritative overviews of topics where there has been notable recent progress and it would be helpful to summarize the advances to a general audience. Typically 10–25 printed pages in length. Printed colour is included at no cost to the author if the Editor in Chief considers it to be appropriate. Rapid Communication: Short reports of original research that are of high calibre and represent a significant increase in our understanding of issues of wide topical interest to the palaeontological community. Typically 4–6 printed pages, including references, with no more than four figures. Printed colour is included at no cost to the author if the Editor in Chief considers it to be essential. Discussion: We welcome discussion of any paper published recently in Palaeontology. Comments are shared with the corresponding author of the original article who may append a response. Both will be published together, ideally in the part after that in which the original article appeared. Technical Report: Reports of significant new techniques or software packages. See For Authors section below for more information. In addition to the articles hosted by the Association and Wiley (see Archive) many can also be found on the Biodiversity Heritage Library: Palaeontology@BHL. 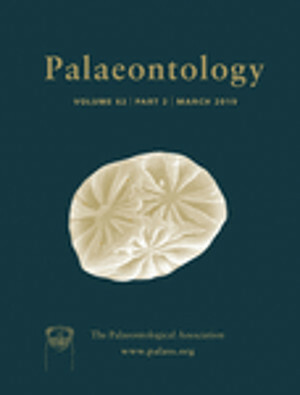 Thinking of publishing in the journal Palaeontology? If so please read our guide to publishing within our journals (covering: how to submit a manuscript; initial assessment; editorial decision; production; copyright and open access; offprints). An initial assessment of the manuscript is undertaken by the Editorial Board, usually within two days of submission. The Editorial Board may also recommend that the scope of the paper is more suitable for Palaeontology’s sister journal Papers in Palaeontology. In this case, the corresponding author will be contacted directly and the paper may be transferred without resubmission. Currently, the journal receives many more articles than can be published in a year. Papers that lack novelty, or are too restricted in their scope, will be rejected without review. A manuscript that lacks broad appeal to the readership and is instead, at best, a worthwhile but not exceptional contribution to specialists is unlikely to succeed. Similarly, papers dealing with one or a few new taxa belonging to well-documented groups will be rejected. Authoritative synoptic taxonomic revisions of faunas/floras or reports of new taxa of international importance are welcome, but must use the new insights gained to address, ideally resolve, a broader issue in palaeobiology. It is imperative that the author demonstrates the wider appeal of the paper to the readership. This should be stated clearly in a covering letter, be obvious from the abstract, be developed in the introduction to the paper, and explored in the Discussion.